Oh…it’s Thursday again and time for still another Create with Connie and Mary Thursday Challenge. And what a GREAT sketch Challenge we have for you this week! We hope you will join the fun! When I sat down to work on this, I had this bird already stamped, embossed and cut out and sitting on top of my desk so I decided to build my card around it! Cherry Cobbler – 4 3/4 x 1 1/2 and 4 3/4 x 1. Ink the top of the Beautifully Baroque Embossing Folder with Cherry Cobbler ink, put in the two strips then run through the Big Shot. LOVE the look! Add these two strips to the card base. Stamp Peace on Earth in Cherry Cobbler on a 4 x 1 piece of Very Vanilla that is cut into a banner. Add to card using dimensionals. 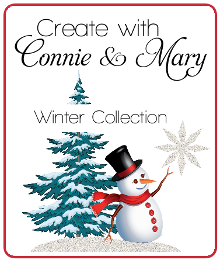 We are almost done with Create with Connie and Mary Winter Collection 2013! So many wonderful ideas and since it’s all about Christmas and Winter projects, it’s PERFECT for this time of year! But you must be a subscriber to see these great ideas…we do not show them anywhere online except for our subscriber. It’s not too late to subscribe…join today! It’s not too early to start planning those gifts and decorating and we have lots of GREAT ideas to help you! See more information over on Create with Connie and Mary! Make sure you check out what the design team did with the sketch and then JOIN THE FUN! 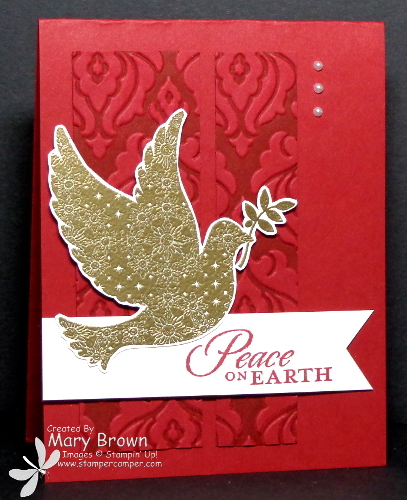 This entry was posted in Create with Connie and Mary, Holiday Mini and tagged Calm Christmas. Bookmark the permalink. What a very regal and elegant Christmas card! Love it! And I love how those embossed panels look! Very elegant! The colors are so rich! Pretty card! The embossed panels remind me of flocked wallpaper – elegant! The entire card is beautiful and very classy. So elegant. The embossing just makes the card! Mary, what a beautiful card! I love the way you did your baroque embossed background and then added a gold embossed dove.. stunning!